The International Pastor’s and Partners Conference (IPPC) had a very interesting session on Wednesday morning with a special talk show anchored by Pastor Lanre Alabi featuring Pastors Deola Phillips, Siji Dara, Wale Adenuga,Ose Oyahkilome and Pastor Biodun Lawal. The Zonal Pastors spoke on strategy and how they were able to apply the strategies to grow their churches. They also highlighted how the teachings of Pastor Chris have helped build them and gave them the encouragement to reach out as much as they have done in their individual Zones. 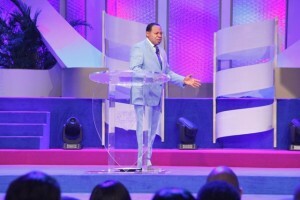 Pastor Ose Oyakhilome spoke on how Christ Embassy has become a reference point in South An institution in South Africa. Pastor Wale Adenuga spoke on the role of prayers in growing the church, he said that for him to teach the congregation to pray, they have to see him praying and he led by example through the establishment of a prayer team that made things possible. Pastors Siji Dara and Biodun Lawal spoke in similar veins especially on strategy and training but Pastor Deola Phillips highlighted the importance of training in growing pastors in the church. Breaking down all the pastors said, Rev. Ken Oyahkilome took the congregants through the an aspect of the history of the ministry and the great things God has done through Pastor Chris in years past saying that the man of God has done great things in the name of God. According to him, even before the members of the Central Executive Council (CEC) Pastor has influenced so many people across the world. Giving examples of when he was younger and Pastor was mentoring different kinds of people. He informed the pastors that they have come to a place where defeats are not recognized, and as such, all they have to do is to listen to Pastor because his words have delivered us from danger. He highlighted all the great works that has happened in the ministry which we should hold on to as signs that God was with us, is with us, and will always be with us. Teaching of the strategic pastor, he said that a strategic pastor must continue in that things that brought you to where you are today. He said that challenges will surely come and that they should not bother about such, giving an example with a tree. According to him, it is a tree that has fruits that men throw stones at. He noted that this IPPC is the end of a dispensation and the beginning of a new dispensation. He warned that pastors should be wary of their confessions saying that your confessions must be consistent with your strategy because language is important. “After you have planned, you profess to that plan” he noted. Ministry material is the answer & the guide to life issues. Glory!!! i am in love with this ministry. Well put, sir, well put. I’ll ceiartnly make note of that.